We had a very busy Black Friday-Cyber Monday 2010 weekend. 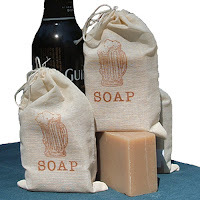 Our BEER SOAP was blogged about & we were selling it faster than we could make it! Throughout Nov & Dec, we participated in our usual local craft shows & even added a new one in Mayfield Village, Ohio. Then it was the mad rush of holiday shopping that kept us busy. But nothing compares to how busy we get during our Annual Half Off End-of-Year Clearance Sale!!! Phew...that week is sooooo CRAZY!! We sold almost every last bar of soap that we had! At the end of the week, we had about 10 bars of soap left...that's it! So, as you can imagine, we have been busy busy busy restocking all our inventory. In fact, we are STILL working to restock lots of our regulars...and some scents that have already been restocked (like our MOST popular, Red Clover Tea Soap) are already getting low again! So, as you can tell, we are keeping very busy. So forgive us for not posting more often! As a very special thank you to our blog followers, we are offering a coupon code that you can use at our Etsy shop, http:///www.ConcordSoap.etsy.com. Use code BLOG25 to get 25% off your entire order!! Thank you for a wonderful 2010! We look forward to an even more amazing 2011! We look forward to being your supplier of high quality, handmade soap, bath & body care products! It's great to hear that you've been doing so well and have been keeping busy! I hope that you can be just as successful (or even more) in 2011!